Just popping in to say, no, I didn’t forget about you! I can mostly be found on Twitter or my Facebook Page. Otherwise, I am currently working on a companion book for Felix the Comet and a picture book for younger readers. The companion book is about Felix’s friend Kelsey the following summer, before they go to 7th grade and Junior High. Her parents whisk her away out of the country, and all Kelsey wants to do is be home for the summer with her friends, riding her bike and swimming in the town lake. She is afraid with all the new classes and teachers in Junior High, she will be placed far away from Felix and Tai. But maybe she will find that visiting long lost relatives in Ireland might not be so bad, after all. Just maybe Kelsey grows up a little bit, finds her voice, and lets go of being such a know-it-all. She also has quite a run in with an Irish Wolfhound that isn’t nearly as cute as Felix’s golden retriever, Cosmo. I may be pretty quiet around here for a while. 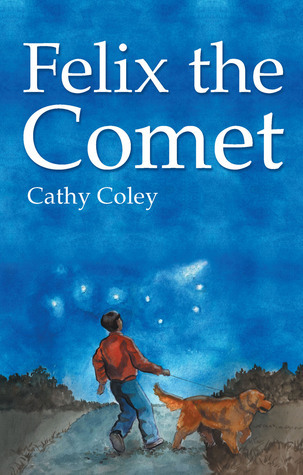 Please feel free to follow me on Twitter or Facebook, and if you haven’t already, click in the right sidebar to order Felix the Comet in paperback or on any ereader by clicking the appropriate cover picture to go to link.